In 1791, Isaac Pickering bought the Foxlease estate, presumably from the widow of Sir Philip Jennings Clerke, who died in 1797, nine years after Sir Philip. Little is known of Isaac, although he does seem to have had interests in the British Virgin Islands – a map of Tortola, 60 miles east of Puerto Rico and the largest of the Islands, held by the National Maritme Museum, carries the inscription: ‘To Isaac Pickering Esq of Fox Lease Hants this Plan of Tortola from actual survey by George King’. At around this time, Richardson, King and Driver on their late 18th century map of the New Forest show an approach road to the house very much as it is today - coming off the A337 Lyndhurst to Brockenhurst road – and also an alternative running from near Goose Green This second road crossed the estate pond by ‘an elegant iron bridge of a single arch’ which after becoming unsafe, was removed in the relatively recent past. The start of the old road, however, still exists as a green lane running off the busy modern road besides an 18th century house known as Old Lodge, once the lodge to Foxlease. The full, old road, though, had disappeared from Ordnance Survey maps by 1898. Local tradition has it that this alternative approach was created to avoid the turnpike trust toll gate situated near Foxlease Bridge, on what is now the A337. Apparently, the Trust retaliated by also collecting tolls outside the new entrance, but whether Isaac was the one reluctant to pay, remains a mystery. In 1827, Isaac was followed as owner by Mr. Wentworth Bayley. In 1828, he sold to Henry Weyland Powell, who at the same time purchased the adjoining land that later in the century was to become Wilverley Park. Married in 1817 to Eliza Buckworth, Henry went on to father four children. Two girls - Clarissa and Mary Catherine - both eventually left Lyndhurst, whilst two boys - Henry Buckworth and William Martin - were both connected with the village for much of their lives. A tablet originally placed in Lyndhurst’s old parish church, but now in the present church, records that old Henry died in 1840 after service in the Grenadier Regiment of Foot Guards at Walcheren, Quatre-Bras and at Waterloo. 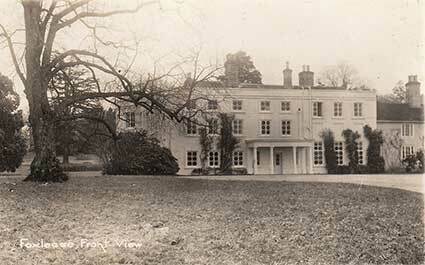 Following Henry’s death, Eliza, almost immediately sold Foxlease for the reported princely sum of 12,000 pounds. The purchaser, James McTaggart, appears in the census records of both 1841 and 1851, whilst Eliza, son Henry and daughter Mary were in 1851 at nearby Cuffnells. But at some time prior to 1855, Eliza bought back Foxlease for 8,000 pounds, which seems to be an extremely good bit of business! The estate was sold again upon her death in 1865 for a reported 23,000 pounds, although between 50 and 60 acres were then excluded from the sale and used to create Wilverley Park. The new owner, Mr. W. G. Stevenson, J.P., remained until 1900, when he sold to Major Barker-Hahlo who, in turn, sold in 1912 to Mrs. Anne Saunderson. And so began the Foxlease association with the Guide Movement that continues to this day.